The thug who attacked Aston Villa midfielder Jack Grealish after invading the pitch during the Birmingham derby has been jailed for 14 weeks today - as it was revealed his pregnant wife and two-year-old child have fled their home over 'death threats' against him. 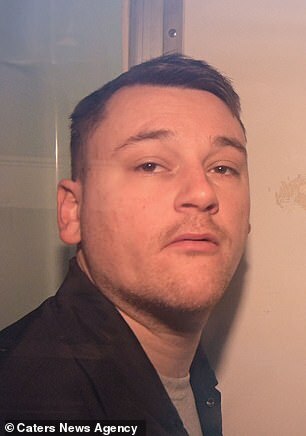 Jobless Paul Mitchell, 27, blew kisses to his family while his mother cried in the public gallery at Birmingham Magistrates' Court as the sentence was handed down. The court heard the married father-of-one, who is a season ticket holder at Birmingham and has been a fan for 20 years, carried out the assault 'as a joke' because he thought the footballer 'was a kn*b'. A statement from Grealish, who scored the winner in a 1-0 victory for Villa despite the attack, said he was 'shocked and scared' at how Mitchell had been able to launch his attack and feared it 'could have been worse' if he was armed. It comes after friends revealed Mitchell, who until recently ran a working men's club, had received 'death threats' for his actions including that his home would be attacked. Alongside the jail sentence Mitchell was also ordered to pay £100 (N47,000) compensation to Grealish - which works out at around half an hour's work for the footballer who is believed to be on £40,000 (N18.9m) a week. Meanwhile Birmingham City confirmed the club had banned him from matches for life.